Gaudete in Domino semper: iterum dico, gaudete. Rejoice in the Lord always; again I say, rejoice. Today is Gaudete Sunday, the Third Sunday of Advent, one of the penitential seasons of the liturgical calendar. During Advent, we prepare ourselves for the coming of our Savior into the world. This preparation can take many forms, including devotionals such as the Rosary, novenas, Advent calendars, and Advent candles and wreaths. Sometimes there is fasting among the faithful, and always the liturgical color is purple, symbolic of solemnity and somberness. During Lent and during Advent, we are given sort of a break in our solemn preparations. But while in Lent, the rejoicing of Laetare Sunday implies open rejoicing, showing our joy, during Advent the Gaudete joy is rather internal, between us and God…or rather between us and the baby Jesus. When I was a child, the Christmas season was always characterized by silence, peace, still nights, often slowly falling snow, and always carols and sacred music. It was a contemplative time. It was a personal time and I was comforted by the images of the manger, the Holy Family, the adoring shepherds and animals. In fact, I was rarely in a somber mood and saw no need for rejoicing on the third Sunday. But I was a child, and I thought as a child, and the anticipation of Christmas was more about the feasting and the celebrating and the gift giving. But I was putting material things in place of the Holy Spirit, wasn’t I? Don’t we all? Let’s go back to the Introit, the introductory part of the Mass and read the words again: “Rejoice in the Lord always.” How I missed the whole message! Let’s look at the First Reading wherein Isaiah is describing how the land will be when God finally comes among us and rescues us from the desert of sin and death. “Glory,” “splendor,” “vindication,” “joy and gladness.” All of these things will come to pass eventually. But for now, we must wait in anticipation. And today’s psalm also speaks of the wonders of the Lord and his love for everyone and how he will reign forever. So on three Sundays in Advent, we are solemnly waiting, contemplating the day of his coming, performing our devotionals, and on one day in Advent, Gaudete, we are reminded that the kingdom of God is already here. Jesus is standing among us, as he stood among the Pharisees, and telling us, in the present and continuing tense, Maranatha, The Lord is come. And being the mortals that we are, we need that reminding over and over. For some of us, myself especially, we need that reminder daily. Maranatha – The Lord has come, the Lord is coming, the Lord is come. “Come, Lord” we entreat. So let’s look today through rose-colored glasses and see the world as it really is, blessed by the coming of our Lord, full of love, life, and hope. And so we pray, Gaudete! 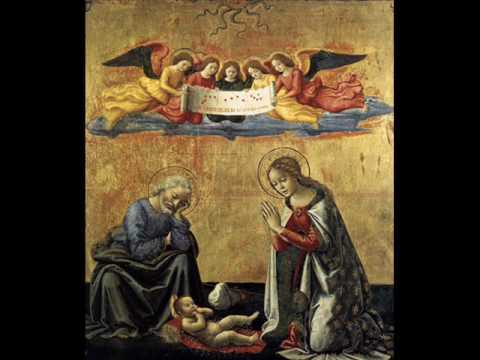 Puer natus is a 14th Century hymn written for this time of year. Chip, Your sermon for Gaudete Sunday, the Third Sunday of Advent, is as beautiful as “Puer Natus in Béthlehem.” Thank you for this reminder of the spirit. You would have made an excellent priest!!!! Wishing you, Susan, & family a joyous Christmas & a cheerful & healthy New Year 2017! Glad to see you on WordPress with a website…..I now “Follow”!!! Bravo!!! Phil & Geri too!